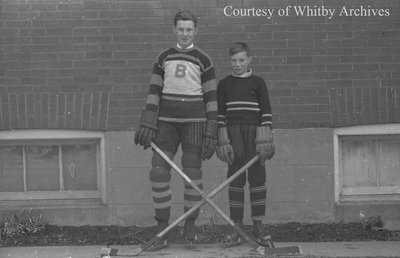 A black and white negative of Ben Lynde (left) and his brother posing in their hockey uniforms and equipment outside of a house. In this view both boys are standing tall with their sticks crossed. Lynde Brothers, March 7, 1938, Marjorie Ruddy. Whitby Archives A2013_040_720B.